Why does the vase have "gold imari" then Foreign underneath:- Hi, I'm not sure as to why a vase which I have picked up today has the following stamp on the botton of it. "Gold Imari" then underneath the logo and then written underneath the logo is the word "FOREIGN". All the lettering is in gold and I've searched and searched online and I cannot find ant of the Imari items with the word "Foreign" underneath the stamp. Is it a fake? If not, why is it stamped as foreign and other pieces aren't? It had paint covering the word foreign, is it worthless if it's stamped foreign? Is it worth anything at all? 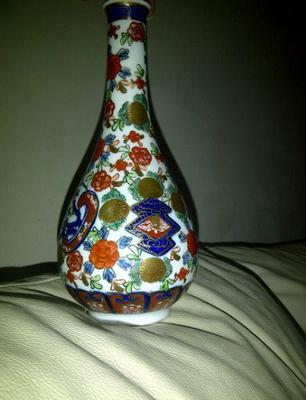 The vase is maybe 9 inches high, slim necked and has a hand painted patten of red flowers incorporating some blues, golds and greens. I have searched the net for this pattern and cannot find another piece with it on! Makes me wonder if it is just worthless tat? Good post, thanks for asking the question. I looked on Gotheborg.com (the expert on Japanese wares) and he says this "Gold Imari" brand label was registered in 1959 by the Arita Bussan Co., Ltd of Nahoya, Japan and kept going until 1984.
relatively recent in terms of Imari wares. The word 'foreign' was a statutory requirement for a period of time with the UK (and other countries) for imported goods. Later these regulations were disbanded as the world adopted a fair trade policy. Originally Arita ceramic products were exported in crates via the Japanese port of Imari and had bold 'Imari' stamps on the wooden crates - therefore it is a natural for people receiving these crates in the West to refer to them as "Imari" wares rather than 'Arita' wares. The word 'Imari' now relates to a style or region, and is not, as many people mistakenly assume, an individual company. Delineations and categorisations are very hard to do with regard to Japanese ceramics because who made what style where, is, let's say, very fluid. One can only generalise and there are always many exceptions to the rules. Imari also became regarded as 'pattern' when English and German companies began to imitate Arita wares. Imari, more than anything else refers to a the use of a certain colour palette repeated on certain recurring motifs. Imari style vases with your brand I have seen been given auction estimates of between $30 - $80 USD, but come sell for as little as $20. They are not tat exactly, it's just that they are not old enough to have a collectible following and therefore the value is purely decorative.